This course is highly experiential and the daily practice is perhaps the most important component. You wouldn’t expect to learn to surf by reading a book about surfboards and waves, and learning a mindfulness practice is no different than any other skill that involves both mind and body. You know from your own experience in learning to play an instrument, or a sport, or any complex skill whatsoever, that practice is important. Your body/mind is the most complex instrument in the universe. It takes time and practice to use it effectively and harmoniously. For this reason, I recommend that you set aside 30 minutes a day for practice. This may be the most difficult hurdle you face in getting started because one of your greatest stressors may be not having enough time for all that needs to get done in a day - how the heck are you going to find an extra 30 minutes? Previous participants have said that after a few weeks of practice, although their time to "do things" is technically 30 minutes less, there can be a feeling of having more space and time, even in the middle of a very busy day. Each week, there will be a few videos by some of the "mindfulness masters", some reading to do, and worksheets to guide you in your practice. Reading and videos will typically total less than 30 minutes per week and will help to motivate and inform each weeks topics. I suggest that you choose a given day of the week to begin your practice week and on that day, you'd watch the video and begin that week's reading. Also, you'll want to download and make copies of weekly practice logs and have them accessible throughout the week. In addition to the Formal Practice, there is Informal Practice, which will help you integrate the learnings and practices into your daily life. Unlike the formal practice, you don't have to schedule this into your day, it's simply having an intention to bring a special awareness into some of the activities that you already do on a daily basis. At the end of each day, you will take just five minutes or so to reflect on the day, using that week's Informal Practice sheet as a guide. Although this may look less important than the 30 minutes of scheduled formal practice, it is through these Informal Practices that you will realize and integrate the concrete and natural benefits of the learnings and practices of MBSR. Before beginning, it's important to consider what it is that you hope will happen as a result of doing this program. For example, you may hope for some effective ways of dealing with stress or worry, ways to cope with illness or difficult life situations, better concentration, an increase in the ability to be present and fully engaged in life, or to accept more fully yourself and others, just as you/they are. What is it that you hope will happen as a result of following this program? Filling out the "Intention Statement" will help you answer this question and will create the foundation for your practice over the next eight weeks. Please print it out now and complete the worksheet. Take your time in doing this. This is especially important because it is difficult to begin a meditation practice without the support of a group and you will greatly increase your odds of staying with this if you are clear about what it is you want out of the course and when and where you will do the practices. 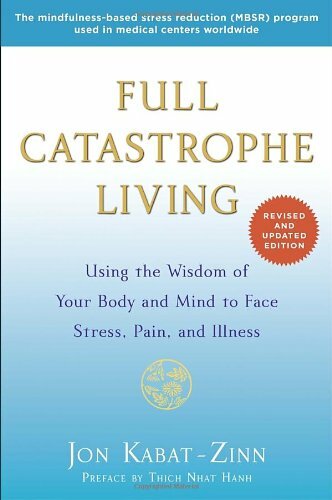 I also recommend that you purchase of a copy of Jon Kabat-Zinn's Full Catastrophe Living to supplement the materials that are presented here. Having the book is not a requirement, but it can be a helpful aid, and if you do have it, at this point you may want to read the Introduction and Chapter 1. If you have the time and are interested, there is a very informative 74-minute video by Jon Kabat-Zinn that goes into much more detail than the short videos above, and also summarizes some of the current research that validates the practice of mindfulness in terms of physical health and psychological well-being. If you have any questions prior to week 1, feel free to contact me at any time.